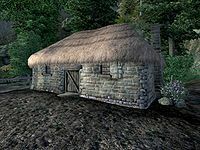 Harm's Folly is a farmhouse between Bruma and Cheydinhal (quest-related). The farmhouse is inhabited by widowed farmer Corrick Northwode. After the death of his wife, Corrick seemingly let the house fall into a state of disarray; smashed barrels, tables turned upside down and empty crates and chests are piled up everywhere and the only organized spot is a well-provided dinner table where Corrick eats his crop by himself. It seats two and contains three tomatoes, five leeks and six carrots. Above the fireplace hangs a painting from Anvil and the cupboard in the corner holds a few additional pieces of food. Along the northern wall, amidst lots of trash, sits the only intact chest with minor loot, a barrel with gardening tools and a cupboard. The basket on the nearby table holds three harvested samples of Arrowroot and the adjacent chest of drawers holds only clutter, as does the drawers at the foot of the double bed. What Corrick lacks in housekeeping, he makes up for with his well-maintained vegetable garden outside. He will work the land extensively every day for 6 hours straight, and he is the proud owner of a whopping 42 carrot plants, 6 potato plants, 12 leek plants and 12 tomato plants. On the east side of the farmhouse you will find the grave of his deceased wife, Kayleen Northwode. After you complete the related quest, you can "pay your respects" to Kayleen by activating her gravestone. You will receive the blessing Kayleen's Grace (Fortify Health 30 points, Fortify Fatigue 30 points, 600 second duration). You can revisit her gravestone as often as you like to receive this blessing. The music played inside the farmhouse is the outdoor "default" type instead of "public", the norm for indoor areas. Esta página foi modificada pela última vez à(s) 15h42min de 3 de maio de 2013.